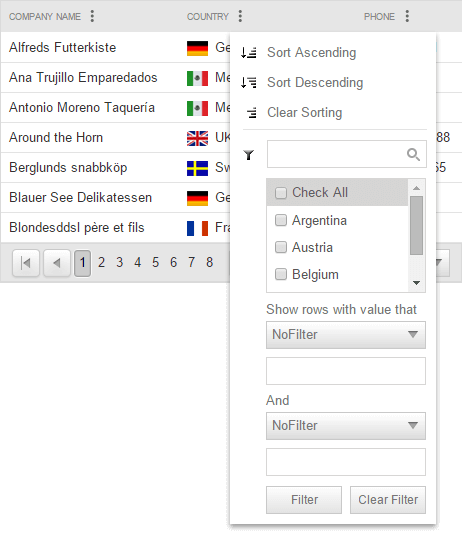 This article describe the filter types in RadGrid that enable filtering based on multiple selected values from a list. Set the FilterType property of RadGrid to either CheckList or Combined. Find all grid columns you want filtered with the checklist and set their FilterCheckListEnableLoadOnDemand property to true. Note that the CheckList filtering functionality works properly only for filterable type of columns or in other words such that implements the IGridDataColumn interface. In short the functionality columns ( Expand , RowIndicator , Button , EditCommand , DragDrop , and Splitter ) are not implementing this interface; therefore they could not be filtered. Please note that filtering functionality is not supported when using simple databinding (calling DataBind() method of RadGrid). <telerik:RadGrid RenderMode="Lightweight" ID="RadGrid1" AllowFilteringByColumn="True" runat="server" FilterType="Combined"
FilterControlAltText="Filter CustomerID column" HeaderText="CustomerID" ReadOnly="True"
FilterControlAltText="Filter ContactName column" HeaderText="ContactName" SortExpression="ContactName"
FilterControlAltText="Filter City column" HeaderText="City" SortExpression="City"
FilterControlAltText="Filter Country column" HeaderText="Country" SortExpression="Country"
<telerik:RadGrid RenderMode="Lightweight" runat="server" ID="RadGrid2" AllowFilteringByColumn="true" FilterType="CheckList"
This filtering type provides look and feel that resembles the filter in Excel. It is available for RadGrid since Q3 2015. To enable this mode you should set the FilterType property of RadGrid to HeaderContext. Then you need to turn on the header context menu (EnableHeaderContextMenu="true") and the context filter menu (EnableHeaderContextFilterMenu="true"). If you are using client-side binding the header context menu must be disabled (EnableHeaderContextMenu="false"). Additionally you should populate the HeaderContext filter menu by using a Web Service instead of using LoadOnDemand feature. The code snippets below showcase a sample scenario where the HeaderContext FilterType is enabled. 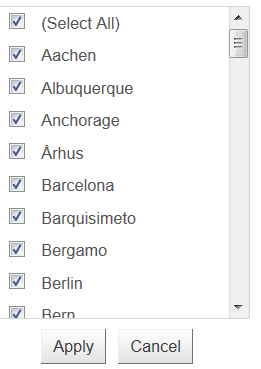 As with checklist filtering there will be a ListBox that displays the available values. You need to provide DataSource for the ListBox. You can use any of the data binding approaches described above. When the ListBox is data bound there will be a TextBox displayed above it that can be used to filter the items displayed in the ListBox. If you want the filters to cascade (contain only values present in the grid data source), you will need to provide an appropriate data source to the ListBox in the FilterCheckListItemsRequested event. You can get the current grid filter from the grid.MasterTableView.FilterExpression.ToString() line so you can use it in your own data source query. Read more on how filter expressions look like in the Operate with the FilterExpression Manually article. You can get the list of checked items via the ListOfFilterValues property of the column.